Nutre Vita Advanced Hair Growth Formula is the product about which you can read in this review. Nutre Vita Advanced Hair Growth Formula claims that its unique formula of Biotin and various vitamins can revitalize your hair by boosting growth generally, and especially in sparse or balded areas. The formula of this product has been clinically tested to prove its efficacy of boosting hair growth. Continue reading this review to find out more. The ingredients of Nutre Vita Advanced Hair Growth Formula are specially selected to increase the rate of hair growth significantly, while also improving skin health and nail strength as an added bonus. This product should not be used by patients with a history of peptic ulcers or any other condition related to high acidity. 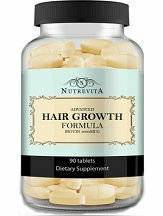 The recommended daily dosage for Nutre Vita Advanced Hair Growth Formula is three pills per day for adults. One bottle of Nutre Vita Advanced Hair Growth Formula, containing 90 pills, which is sufficient for one month of standard use, costs $44.99 plus shipping, which is somewhat more expensive than the average. There are no monthly subscription models on offer. After using Nutre Vita Advanced Hair Growth Formula for a little over two months, I have been underwhelmed by the results. It takes for a long time, even by hair-growth standards, for there to be any visible improvement, and even that is somewhat lacking. Nutre Vita Advanced Hair Growth Formula does get results, but not the kinds that are advertised or achieved with other products. As we mentioned previously, this product should not be used by patients with a history of peptic ulcers or any other condition related to high acidity due to the presence of Betain hydrochloride, which may aggravate these issues. Nutre Vita Advanced Hair Growth Formula is covered by a full, 100%, no questions asked 60 day money back guarantee. There are no customer reviews present on the manufacturer’s website, which is slightly disquieting. Nutre Vita Advanced Hair Growth Formula is a product which can provide our systems with a host of essential vitamins which our average diet lacks, and also improves the health of our skin. However, we must consider the lack of customer reviews, the considerably high price and the fact that most competitors are more effective.